Many people with corneal disease can be helped by regular corneal transplantation using tissue transplanted from human donors. However, in some cases such transplantation is hopeless, or nearly so. In these situations, a small number of institutions in this country and elsewhere have resorted to the implantation of a keratoprosthesis of plastic material which serves as an artificial cornea. In effect, the prosthesis provides a clear window in the clouded cornea. Although this idea is obvious and has been tried for a long time, it has taken much research and clinical trials to develop prostheses that can tolerated by the eye over a long period of time. The keratoprosthesis that was designed by Claes Dolhman, MD, PhD, at the Massachusetts Eye and Ear Infirmary, is made of medical grade polymethylmethacrylate—the same material that is used in contact lenses and in intraocular lenses after cataract surgery. 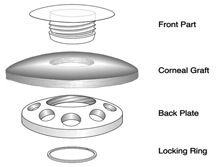 The device is shaped like a collar button and it is inserted into a corneal graft. This graft-prosthesis combination will then replace the patient’s cloudy cornea. If the natural lens is in place, it is also removed. Finally, a soft contact lens is applied. Most candidates for keratoprosthesis have little eye inflammation (after corneal edema, trauma, infection, transplant failures, etc. ), and prognosis for a keratoprosthesis is very good. The majority of such patients do very well for a long time and the vision as a rule becomes much improved. Infections are very rare as long as prophylactic antibiotic drops are instilled on a regular basis, usually once or twice daily, for life. Eyes needing a keratoprosthesis often have glaucoma, requiring standard anti-glaucoma mediation, occasionally even surgical implantation of a valve shunt. Patients with keratoprosthesis require regular ophthalmological examination. It is customary to return every month for a check-up during the first half year. Subsequently, the intervals can be longer. Medication, usually as drops, will have to be taken for life. Also, soft contact lens wear around the clock (no discomfort) is recommended for safety. Since 1990, several thousand of these keratoprostheses have been implanted worldwide. More than half of these patients have achieved marked and long-term improvement of vision. Click here to watch a video about one of our patients that received this implant.